Some Cool Videos from ISKCON News! ~ The Toronto Hare Krishna Temple! Some Cool Videos from ISKCON News! 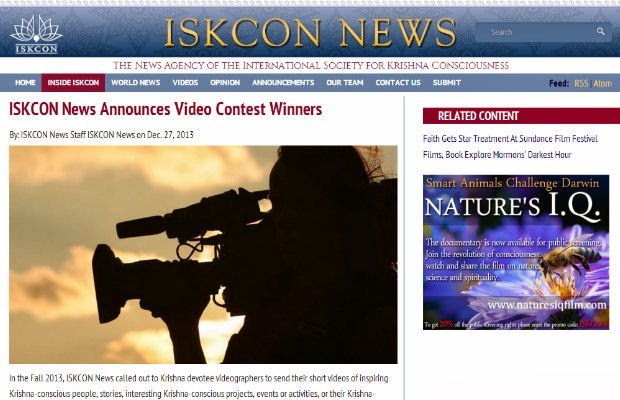 In the Fall 2013, ISKCON News called out to Krishna devotee videographers to send their short videos of inspiring Krishna-conscious people, stories, interesting Krishna-conscious projects, events or activities, or their Krishna-conscious music videos. There were over 50 contestants applied from 14 different countries, and shared their inspiring short films of various subjects, including festivals, spiritual retreats, Deity worship, outreach and artistic programs.